Girls Football Teams Take Home the Victory at Battle of the Borders | Manitoba Aboriginal Sports and Recreation Council Inc. The North Winnipeg Nomads Football Club was established almost 50 years ago and was originally a Bantam football club. This soon grew to accommodate athletes from ages 7 to 22 years old. The Nomads pride themselves in having one of the largest enrollments in Canadian Amateur Football. In 2010, the Nomads started a women's tackle football team called the Winnipeg Wolfpack who compete in the Women's Western Canadian Football League. This paved the way for younger girls the following year. In 2011, the Nomads established both junior girls and senior girls teams in the Manitoba Girls Football Association. This made Manitoba the first in North America to have an all girl football teams. Manitoba was then followed by Utah and Indiana. As the years have gone, these two teams grew and developed to become strong teams. Coach Derek Hart shows a lot of pride in the Indigenous representation on both of these teams (athletes and coaching staff). Today, over 50% of the senior team and over 60% on the junior team are of Aboriginal descent, not to mention 4 coaches and 1 manager. There is no doubt that these groups of girls are forces to be reckoned with. 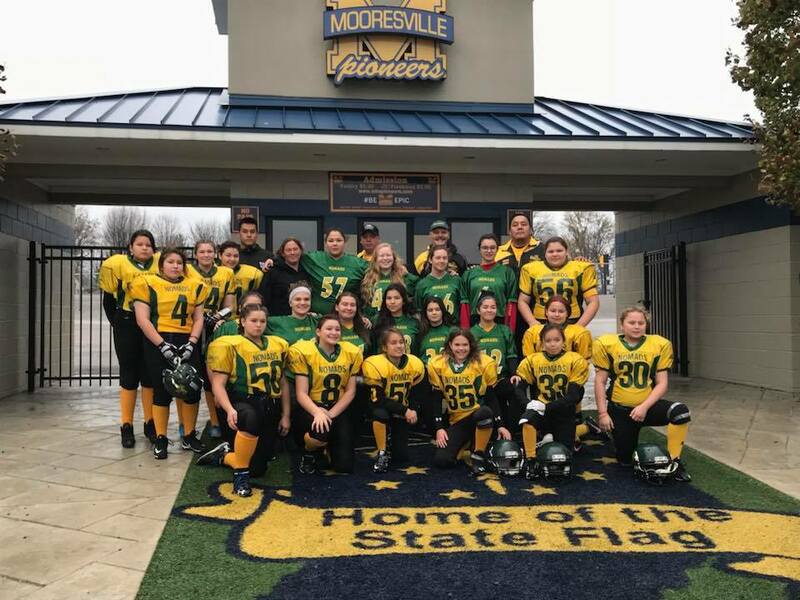 In 2017, the junior and senior girls teams were challenged to play against the Indiana Girls Tackle Football League in Mooresville, Indiana (near Indianapolis) in the United States. They called this the Battle of the Borders. These games marked history as the first ever grassroots girls cross border tackle football games. The Nomads traveled with a number of family members and supporters to Indiana to compete. On November 17, the teams showcased their skills and abilities by battling against the Indiana teams. After a lot of determination, the junior girls team battled hard and won 34-32. The senior girls team also came out victorious by winning by a landslide with a score of 40-6! It comes to no surprise that these girls earned this week's CTV's Sport Stars of the Week! Congratulations North Winnipeg Nomads! You made us proud!